check out Dan Blank’s new course about how to build your author platform. I’m a big fan of Dan’s, and I’m psyched about this course. I love this! Also: thanks for the mention, very much appreciated. Me, sexier?! I don’t think that’s possible. Great post and great reminders. Congrats on the audiobook!!! 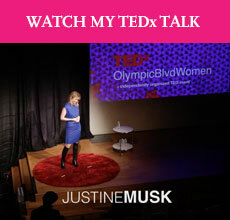 I value your blogs, Justine, and forward them to my writer friends! Thanks. Yes, a horde of creative writers are coming to take on being authors. I’m scouring across the daily brainstorm and your blog was the first one I’ve found captivating enough to wake me up and hold my attention. Good job! I read your post on being a creative badass, also an awesome post. Can’t wait to see more of you. This is an excellent post. I do see a lot of authors wasting their time social media. I really liked what you had to say about the blog and how it can be a hub. That’s what we’re doing at WDWPUB. I hate to say it, but most writers are wasting a lot of time on social media. Mainly because they don’t have a plan. They don’t have a plan, because they don’t have solid, specific long-term goals. The first thing in Warrior Writer is setting a single, specific, strategic goal. The comment that a blog can be a book is a good one. Since you’re investing your time in writing the blog, make it part of a non-fiction book. No one really wants to read snippets of fiction on line. So the blog needs to be part of your platform, whatever that might be. One thing we learned at Write It Forward was to be consistent on blogging. It’s hard work and the results are not immediate. I used to believe content was king. And it is. But promotion is queen, whether we like it or not. I like the visualization of the blog being the center of the wheel. Interesting blog post. I often wonder about social media. I see so many people on it doing the same thing. I’m still trying to figure out how to stand out. I’ll definitely take you suggestions into consideration. I think social networking helps. I know my sales more than doubled when I started blogging and tweeting. Even though I’m not so much ‘promoting’ my own work as replying to blogs, chatting with readers, etc. I use my blog for different things–rants, contests, general discussion–going to start author interviews. I think it’s important to decide if your blog is going to be about YOU or your work, though. I read that somewhere. A blog about writing attracts writers–but does it attract readers? That’s what I’m wondering. Readers is what I want to attract. But, seriously, do readers care that I prefer Diet Coke to Diet Pepsi? Or do they want to see a snipped of my WIP? Hmm…still don’t know the answer to that one! Very interesting! I’ve had a blog for several years. But now I have a book contract. So, I find myself looking at it differently. Right or wrong, I’ve chosen to focus most of my posts on my journey toward publication. I don’t know if that’s good or bad but it is what’s going on in my life. I also believe that everyone has a story, so I’m working on posts that encourage others to get their stories written down. I do feel a bit like a fish who is trying to find her school in a very large ocean though. Well, this post of yours answers its own question, doesn’t it? The timidity factor within the writing world is pretty high. You appear to be fighting the good fight for many who can’t, so in this case your blogging is certainly not wasted. Just the opposite, because while many can see the trees, for whatever reason they never push through to the forest, as you do. Back to your titular question; blogging is probably never wasted, because it’s a given that writing about personal experience is therapeutic. And in the end, the trick isn’t having thousands of indiscriminate followers/readers. All one needs is a relative few of the right ones. Look how South Park took off after Trey Parker and Matt Stone sent their video to George Clooney. Their success was based on the right guy seeing it! Please keep your posts and videos coming. I think you’re onto something. Great post. There is no such thing as “Social Media Strategy”… only *Marketing* Strategy. You are describing the techniques I’ve been using to increase my fan base (and, subsequently, dramatic increases in book sales) on Facebook. ALL about quality of content and focus… and that’s what has driven my book’s FB fan page from 601 Fans in March 2010, to 384K+ Fans as of February 2011 — with a 72% monthly return rate… all achieved zero marketing dollars. Cheers to your vote for quality content!